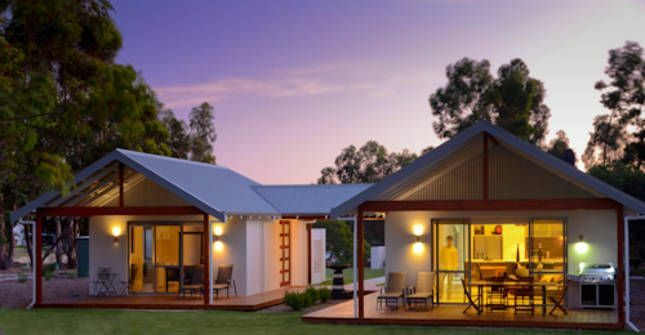 The Bungalow Villa is part of the Yallingup Luxury Retreat complex and provides the perfect accommodation for discerning couples, friends or families. Experience amazing premium wineries, art galleries, innovative restaurants, hidden caves and pristine surf beaches all located in close proximity to the villa. This beautiful villa exudes a contemporary and modern feel. A pavilion style structure, the Bungalow Villa has 2 distinct zones and can accommodate 6 guests in total comfort. The larger zone boasts a stunning fully equipped kitchen incorporated into a huge open plan living/dining area with wonderful wood fire. The living area leads out through large glass doors to an undercover alfresco timber deck with bbq the perfect place to relax and unwind overlooking the garden and a bushland reserve beyond. Quietly positioned at the other end of the building are 2 bedrooms and a large bathroom/ensuite with separate shower and bath. The smaller zone features a spacious studio bedroom complete with kitchenette and a gorgeous 4 poster king bed, an all white spa ensuite with separate shower and a private undercover timber deck off the bedroom. The Bungalow Villa’s thoughtful design gives our guests the unique opportunity to relax or dine together, (perhaps with our private chef service or a leisurely BBQ on the deck), then retire to enjoy your own private spaces. The Bungalow Villa is fully self contained and appointed with; 2 king size beds, 2 single beds, full sized fridge, mini bar fridge tea & coffee facilities, iPod dock, DVD, wide screen TV's, laundry, temperature control and bath robes. The Bungalow can be booked as a whole villa and can sleep 6 guests or it is possible to book the larger pavilion alone, which sleeps 4 guests at a lower rate of $385 per night. * Two night minimum stay * Three night minimum on long weekends and Christmas/New Year, 4 night minimum at Easter. It was a most pleasurable stay and we were welcomed by lovely staff which made our stay quite special.